Hey everyone! So my next review and giveaway is for Peter Rabbit Organics. 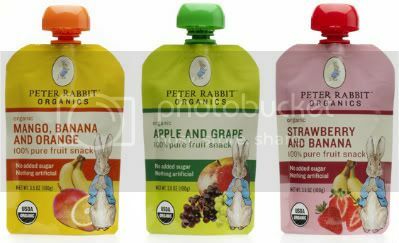 As their website says: "Peter Rabbit Organics™ strives to provide provide healthy, organic snacks for all to enjoy. The delicious fruit snacks contain 100% organic fruit with no added sugar or anything artificial. Peter Rabbit Organics™ is a small company that started in the UK. 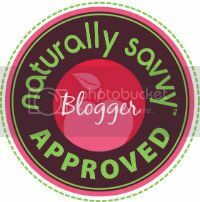 When their squeezable organic fruit became huge hit at home, they decided to bring their fruit snack to the US!" I got to try their three flavors: Strawberry Banana, Apple and Grape, and Mango, Banana, and Orange. These snacks are made from pure, organic fruit, our BPA-free pouches have no added sugar or preservatives. Their organic ingredients are certified by the USDA. The 3 delicious pouches have a thick, smooth texture and aren't diluted with water or juice. I feel like these snacks are great for moms on the go. Instead of giving their kids a messy snack like cheese-doodles or chocolate, or even chips or fruit snacks that are gummies. They can fall everywhere or just be a mess on the kid's face. These snacks come in easy to open (and close) packs. The nozzle up top where they eat out of is small, great for kid's mouths so nothing falls anywhere else but inside of the mouth, haha. They taste like smoothies kind of any are great whether you put them in the fridge or just have them at room temperature. I kind of liked them but again I feel like kids would enjoy them a lot more. The texture was a bit weird for me, it was like eating/drinking a smoothie without milk and I'm a big smoothie person. The apple and grape was my favorite though, it tasted like a mixture of apple sauce and grape juice. It sounds weird and I was very wary of it at first, but it tasted really good. I really didn't like the mango, banana, and orange one mainly because I hate mangos. But they were okay. Again, great for children. It's healthy and still satisfies their sugar craving. I also liked that the bags were very durable. I opened it and closed it and just experimented with how long the cap holds but throwing it around, squishing it, etc. and the cap never re-opened. It was really great. All in all, great product especially for moms that want to give their kids a sweet, yet healthy snack. This isn't your average fruit snack because there's actually real fruit in this! Nothing artificial. Awesome! Buy It! Head on over to Peter Rabbit Organics website "Where to Buy" tab and see where there's a store near youu (like Starbucks) that's selling them or buy online! Win It! ONE winner will receive 10 assorted pouches for themselves! ONE winner will be chosen on November 5th, 2010 at 8pm (EST) and then will be emailed. Alternate winners will be chosen if winner does not respond after 48 hours. Thank you and good luck! I was provided a product for free in exchange for my review. I'm most excited about trying the Apple and Grape. I want to try Apple and Grape. I'd like to try the strawberry banana! Thanks! I would like the strawberry banana. Strawberry and Banana would be my flavor of choice! Im most excited to try the Apple and Grape flavor. I follow StarIMPULSE on Blogger. I want to try the apple and grape. I can't wait to try the Strawberry Banana. I would like the apple and grape!